I loved sloppy joes as a kid but I don’t know if my mom made them from the canned sauce, a sauce packet or from scratch. I tried the canned stuff once and it was awful! I’ve tried making up recipes a couple of times with mild success but they just didn’t taste right to me. So, I gave up and didn’t think much about it for the last year or two. But recently I’ve run across a couple of homemade sloppy joe recipes that made me want to try again! The first was at Something So Clever. The photo is what made me start craving them again! Then I ran across another recipe in Real Simple’s cookbook. I don’t own the book but was able to browse through it online and saw the recipe. This recipe is loosely based on the Real Simple version but I added ketchup and brown sugar to sweeten it up a bit. 1. Saute onions, peppers and garlic in olive oil until softened. 2. Add ground beef and cook until no longer pink. Drain fat. 3. Add all other ingredients to the ground beef mixture and cook, stirring, over low heat for a few minutes until thickened. Add more water if it gets too thick. 4. Serve in hamburger buns and make a mess! 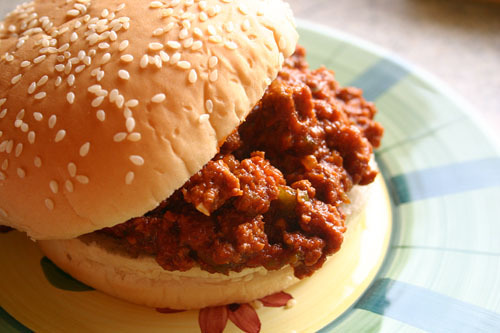 I've never eaten sloppy joes but this looks really yummy and makes me want to give them a try! If you've never tried it, next time you make sloppy joes, put plain potato chips on the sandwich, too... It adds a texture that's irresistable! Thank you so much for this recipe. My daughter loves sloppy joes and for some reason (who coulda guessed) I was unable to find a decent one...so I gave up...until this came so lovingly free in my email! It's just right! My boys love sloppy joes...manwich...ewe...I do not... Now we all love this healthier version much better! Thank you!! Thanks for the recipe. Will be trying this real soon. I know what you mean about the canned stuff, like Manwich and some others. They're absolutely vile. I usually end up using about a half bottle of barbecue sauce to try and cover up their taste. Of course, Spagetti-O's have been in business for ages, and they're not particularly tasty, either. --Cinnamon in this, how unusual. Chad: Glad you liked it! Did you see the other, more recent, sloppy joe recipe? Check it out the The Ultimate Manwich! Love this sloppy Joe.It was funny that Stacey brought up spagetti o's . I cant see how people can open up a can of that stuff and still be breathing.The rancid sauce alone would knock a prize fighter out.Anyway good sloppy joe. made this and i loved it. both on plain buns and the way i love my "joes" with hoffmans super sharp cheese melted on the bun and hamburger (sweet) pickle chips, and some extra mustard. I made these today and they are delish! No cinnamon added though. I tried this out- with some changes, and mainly rather than using ground beef I used the MorningStar crumbles- turned out delicious! Definitely better than the stuff from a can!